There will be stars at every turn when 75 horses contest the eighth running of QIPCO British Champions Day at Ascot on Saturday. Britain’s richest raceday, with £4.47 million of prize money on offer, will feature a glittering cast who have already helped provide many of this season’s highlights. 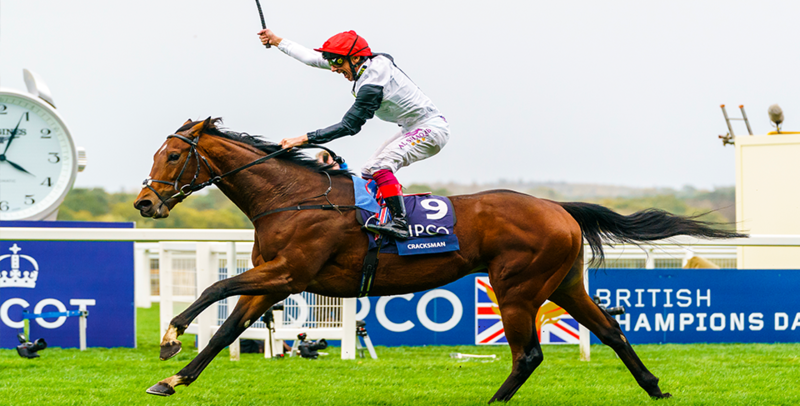 A high class field of eight will line-up in the £1.3 million showpiece, the QIPCO Champion Stakes, including the star trio of Cracksman, Crystal Ocean and Capri, while Roaring Lion, French ace Recoletos and prolific filly Laurens will be among those locking horns in a compelling QIPCO-sponsored Queen Elizabeth II Stakes, which has attracted a bumper 15 runners and carries prize money of £1,156,250. Outstanding stayer Stradivarius, whose successive wins in the Mansionbet Yorkshire Cup, Gold Cup, Qatar Goodwood Cup and Weatherbys Hamilton Lonsdale Cup this year earned his connections a £1 million bonus offered by Weatherbys Hamilton, head s seven runners in the QIPCO British Champions Long Distance Cup. The Tin Man and Librisa Breeze, the past two winners of the QIPCO British Champions Sprint Stakes, are among 14 in this year’s £632,500 renewal, and another seeking a repeat success on the day will be the Aidan O’Brien-trained Hydrangea, who is back to defend her crown in the £600,000 QIPCO British Champions Fillies and Mares Stakes. Among Hydrangea’s ten rivals will be Lah Ti Dar, owned by Lord and Lady Lloyd Webber. She won her first three races this year by an aggregate of more than 19 lengths before meeting defeat for the first time when runner-up in the William Hill St Leger last month. Completing the spectacular card is the £250,000 Balmoral Handicap, the richest mile handicap in Europe, which has drawn a maximum field of 20. The first QIPCO British Champions Day, in 2011, was illuminated by the mighty Frankel, who returned 12 months later to sign off his flawless 14-race career in the QIPCO Champion Stakes. The mere mention of the great horse’s name warms the hearts of racing fans and several of his offspring will be in action on Saturday, most notably Cracksman, who evoked memories of his sire when a scintillating seven-length winner of the QIPCO Champion Stakes 12 months ago. He clocked the fastest final furlong of any horse running on the day, even though three of the races on the card were run over shorter distances. Cracksman has added two more Group 1 triumphs to his CV this year and will almost certainly be having the final run of his career before he is retired to stud. He will wear first-time blinkers in an attempt to keep his mind focused on the job. The colt, bred and owned by Anthony Oppenheimer, forms part of a strong QIPCO British Champions Day squad assembled by Gosden, who leads the Trainers’ Championship (which is contested over the calendar year) by more than £1 million. “I enjoy training horses, being around horses,” Gosden said on the eve of a meeting. “It’s a passion, it really is. I’d feel a bit weird if I woke up in the morning with nothing to do. I’d certainly drive my wife mad if that was the case. It is not only the leading Flat trainers who will be competing for a slice of the glory. Willie Mullins, the serial champion National Hunt trainer in Ireland, will be represented by the Rich Ricci-owned Doncaster Cup winner Thomas Hobson in the Long Distance Cup.